The Joy of Painting ended nearly 25 years ago, but Bob Ross is still inspiring a new generation of fans to embrace their mistakes. Now, that classic bit of wisdom has been turned into a party game. 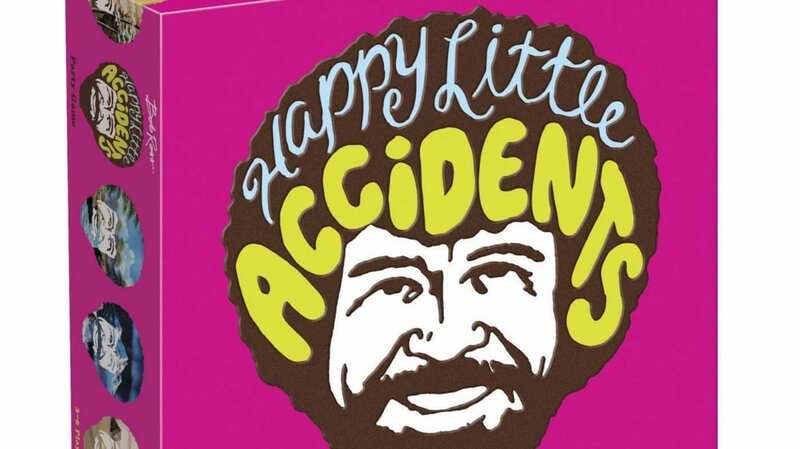 Happy Little Accidents from Bob Ross Inc. is a game for three to six people ages 10 and up. Equipped with markers and paper, players have a limited amount of time to transform abstract shapes and squiggles into works of art. When the timer runs out, players share their masterpieces and award points to the creations they like best. Hours of experience watching Bob Ross turn smudges into charming trees and clouds isn't required, but it may help your gameplay. Playing time is listed at 15 minutes, but there's no reason you can't extend the game to last the length of the next Joy of Painting marathon you have planned. One box, which includes cards, paper, markers, voting tokens, a sand timer, and instructions, is available to purchase for $28. If you're looking for a gift for a Bob Ross fan, the Happy Little Accidents party game is just one excellent option. You also have Bob Ross socks, mugs, and Funko Pop! figures from which to choose.